(Bloomberg) -- In a Democratic presidential field that reflects a diverse and female voting base, candidates who are white and male are grappling with issues of race and gender in new, and sometimes uncomfortable, ways. The result has been some earnest discussion of privilege, a few apologies and the occasional stumble. 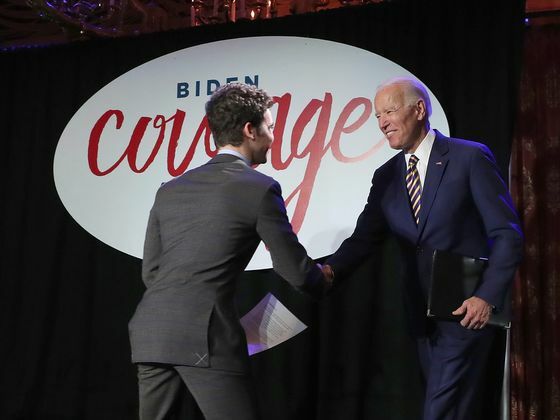 Former Vice President Joe Biden, who’s expected to announce whether he’ll join the campaign next week, hit both notes Thursday night at an event hosted by the Biden Foundation and It’s On Us, a campaign to end sexual assault. He blamed “a white man’s culture” for violence against women and expressed regret over the way the Senate Judiciary Committee he chaired treated Anita Hill when she testified in 1991 about alleged sexual harassment by then-Supreme Court nominee Clarence Thomas. The “bunch of white guys” on the committee “didn’t fully understand what the hell it was all about," he said. Women and minorities are essential parts of the voting coalition that the eventual nominee will need to defeat President Donald Trump next year. Trump’s past comments about women and on race have helped drive female voters in particular toward Democrats. The result was a record number of women being elected to Congress in 2018 -- overwhelmingly as Democrats -- and a historically diverse pool of candidates seeking the party’s nomination for president in 2020. Six women are seeking the Democratic nomination: Senators Kirsten Gillibrand of New York, Kamala Harris of California, Amy Klobuchar of Minnesota, and Elizabeth Warren of Massachusetts; Representative Tulsi Gabbard of Hawaii; and spiritual guru Marianne Williamson. The entire field includes five people of color and a candidate who would be the youngest person and first openly gay man elected president, South Bend, Indiana, Mayor Pete Buttigieg, 37. Yet it is Biden, 76, and Vermont Senator Bernie Sanders, 77, who hold solid leads over the rest of the field in every one of the early polls, together garnering more than 50 percent support in the most recent surveys. Several white male candidates have joined Biden in apologizing for past stances or statements. Sanders, addressing accusations of sexual harassment against senior members of his campaign, said earlier this year he was "a little busy running around the country" to notice the allegations. Sanders later publicly apologized to and privately met with the women who said they were harassed or mistreated while working on his campaign. Former Texas Representative Beto O’Rourke, who raised an eye-popping $6.1 million in campaign donations in the 24 hours after announcing his candidacy, apologized for what he called a "ham-handed" joke about how his wife raises their kids, sometimes with his help, and has discussed "privileges" he’s had that others have not. Candidates like Biden and Sanders understand that "literally who they are is out of step with where the party is," said Jess Morales Rocketto, who led digital organizing for Hillary Clinton’s 2016 campaign. Kelly Dittmar, a scholar at the Center for American Women and Politics at Rutgers University, said a significant change in this election is that men are now required to discuss the role their gender plays in their campaigns. Women and people of color who run for office “have often had to talk a lot about why it matters that they’re women or people of color,” she said, while white men are rarely asked about their identities. “Men overall and white men specifically are being asked about the ways in which gender affects their decision making,” Dittmar said. She the People, an organization formed to give minority women a greater voice in politics, has invited all the declared candidates to a forum April 24 at Texas Southern University. So far, O’Rourke, former Housing and Urban Development Secretary Julian Castro and Senator Cory Booker of New Jersey have confirmed they’ll attend. Aimee Allison, the group’s founder, said the forum would be a chance for candidates to "go beyond platitudes" to discuss what they would do to end gender and racial inequality. Others have struggled. At a CNN town hall last week, Colorado Governor John Hickenlooper was asked if he would commit to naming a woman to the ticket. He said he would, but wondered why women aren’t being asked if they’d put a man on the ticket. Lauren Hitt, a spokesperson for Hickenlooper, said he considered the "reductive" because it dismisses the chances of a woman winning and reduces the women running to their gender. Morales Rocketto said that while Hickenlooper’s response was "tone deaf," asking men if they would pick a woman to be their running mate doesn’t capture the "watershed moment around gender" in this country right now.